SIZE: Gazebo Park is the largest Gazebo display in the midwest. We have 14 different gazebos in 7 sizes that are all shown with furniture. That is important because without furniture it is difficult to determine which size will be right for you. OPTIONS: We have dozens of options to choose from. 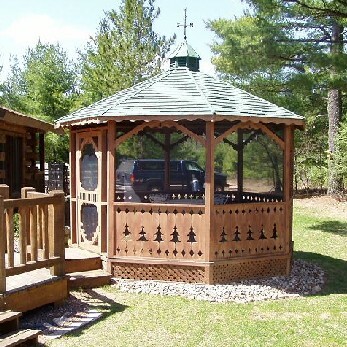 There are different styles, windows, lighting, colors, stain types, weather vanes and much more all shown at Gazebo Park. QUALITY / DURABILITY: The true test of quality is longevity. We show some gazebos that are 10 years old so you can see why we are the only company to offer a complete warranty on our product. We show different stain types so you can choose the right one based on attractiveness and durability. HOURS: We are open 24/7 by appointment. Phone numbers & map are listed on the Gazebo Park page. Press ESCAPE, Click on X (right-top) or Click Out from the popup to close. At Heartland Gazebos Ltd. we start with the white cedar log to craft a beautiful, intricate gazebo to give you a lifetime of enjoyment and we completely assemble it on your site. We stress quality in construction and complete customer satisfaction. For that reason we do not offer our standard product in "kit" form. We assemble the gazebo ourselves so there are no "missing parts" and everything fits together properly. We are a small company specializing in unique designs in Traditional Gazebos and exceptionally distinctive Rustic Log Gazebos. We control our costs by harvesting and processing the cedar ourselves. That way we can offer a totally completed gazebo for less than the cost of most kit models that you put together yourself or have to hire a separate contractor to erect. 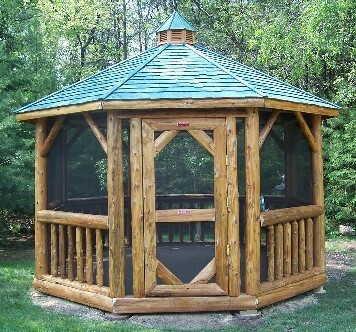 Log gazebos are delivered and installed in most states. Call for details. The gazebos are made entirely from eastern white cedar. The floors are constructed with pressure treated wood. Delivery and assembly is free within a 50 mile radius of Wausau, Wisconsin. Custom designed models available. Inquire by phone or e-mail. Questions? See our Questions and Answers page. Come see what's new- Gazebo Park! And a new tree design!! Check out our new styles page and come back often for updates on our new designs!